Well, I did get better from the M.E. episode, but have had a throat infection and no voice for the past 12 days. Harrumph. I’m better enough to do things like have my hair cut, and I went to the knitting group today, but it’s so frustrating only being able to whisper. And the funniest thing is that whenever I explain to anybody I have no voice, which involves pointing my flattened hand, palm down, at my throat, and waving it from side to side, whilst whispering “no voice”, most people then whisper back to me. The guy who cuts my hair actually started using an improvised sign language, bless his heart, so I cough/laughed and said “I can hear you!” and it was all fine. But for a week or so I was not well. No knitting, no guitar. In bed, very tired and weepy. Bummer, big old bummer. However, yesterday I felt up to some tidying up in the garden. I cut the dead dicentra right back, deadheaded the buddleias and trimmed the whippy growths off the wisteria and the golden hop. It only took half an hour but the garden looks so much tidier. I do have a new plant (heuchera, Ginger Peach) but haven’t decided where it will go yet. I think I’ll do that tomorrow. Bought some new stuff at the knitting shop today – some of it is for me to knit Xmas presents, some of it is for a present just as it is. Nearly finished child’s hooded jacket – cast on the hood today. Must find some interesting buttons though. Hmm. YD is feeling much better now she’s 20 weeks. All is well, she looks fabulous and feels good too. Thank goodness. ED is still luxuriating in motherhood with her delightful little boy. The Malvern grandchildren came to stay last Friday – Sunday. We went to Ragley Hall, which has an excellent adventure playground, perfect for an 11 year old and an almost 14 year old. Trampoline, high rope bridges, monkey rope, zip wire, wonderful. We just made encouraging noises and provided large pieces of chocolate cake and hot chocolate with cream on top at the fabulous cafe afterwards. And of course we were both in need of sustenance too! Just treated myself to a new handbag, new ankle boots for the winter, and some new underwear. I had to research it long and hard on the internet, but for once, everything is actually perfect! The bag is the right size and shape, the underwear is fabulous, and the ankle boots I actually went to the shop and tried several pairs on. I’d taken socks and my orthotic insoles with me to make quite sure they would fit with my winter gear. And they do. Good old Marks and Sparks. Much better, in fact. Am having to be very careful, and not do more than three things in seven days. Also making sure I sleep every afternoon. Usually 2.5 – 3 hours. Been knitting again – finished more Christmas presents, and a lace-fronted cardigan which had been causing me grief. I couldn’t manage the lace front which was in the pattern, so substituted a different one. It involved quite a lot of searching and maths-type thinking to ensure that it was the right sort. But managed it ok I think. 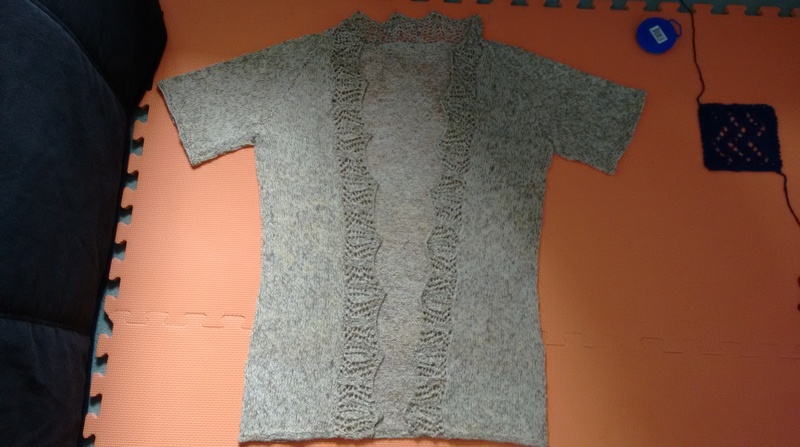 Finished it last night, it’s currently “blocking”, as you can see in the photo. The garden is looking pretty good considering it’s August and it can look a bit scraggy at this time of year. But the crocosmia “Lucifer” really brighten it up, along with the hydrangeas. Guitar lessons are going well too. Have learned a few more chords, and am able to play a few more songs now. At home, when I’m practising, I like to sing along if my voice allows. Sometimes it’s a bit croaky, but today I was in (comparatively) good voice. Thermomix: I’ve made double berry dairy free muffins, carrot cake, and pizza dough. The first time I used it was fraught, but the muffins turned out fine, and I’m better with it now. Next up will be the (dairy-free) sponge base for a trifle. Hubby uses it most days, either for lunch and/or dinner. He loves it. The counselling is going well, and helping with my “issues”. Feeling lighter (of mood) and more at peace with my life. I actually have a lovely, lovely life, and our house just feels peaceful and calm. The counsellor is a wonderful woman, very good at listening and analysing stuff, and makes me think about stuff in a firm but gentle way. Upgraded to Windows 10 today. It was very smooth and quick. Doesn’t look particularly different from Windows 7, the only niggle I have (and many others too going by the chatter on the internet) is the colour of the menu bars. They are white. All of them. So you can’t tell which window is live. I’ve fiddled about a bit (a lot) and found one workaround which will allow you to have one menu bar coloured, so you can tell that one is live, and at the same time allows you to have a slide show background, but only one of the standard pre-installed ones. It’s a little niggle, and doesn’t really affect the functionality, but it’s an odd little thing for the developers to have done, really. Fingers crossed that they fix it soon. It also seems that Microsoft are not going to make a charge for updates/upgrades, except to businesses. We shall see. First time they try to charge me, I’m off.